[Berg / "Lyrische Suite"]: Fleming sings with velvety evenness, threading her vocal line through the swirling strings . . . it's the performance of the whole work by the Emersons that it is so remarkable; there is much more emotional directness, less of the usual armour-plated efficiency about their playing, and that, combined with the total technical assurance, suits the world of late Berg perfectly . . . [Wellesz]: The pairing with another nearly contemporary work for soprano and string quartet is a hugely rewarding one too . . . The vocal and string writing are both immaculate, and the world of each song is perfectly evoked; Fleming handles them all with great care. Berg poured all the ecstasy of a love affair into his intensely concentrated "Lyric Suite" and the Emerson String Quartet's tensile, perfectionist playing makes sure not a note is wasted . . . [who better to draw new listeners to Wellesz's music] than soprano Renée Fleming at her most ravishing?
. 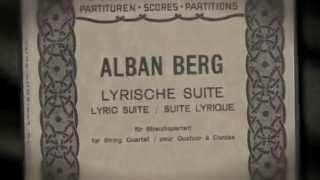 . . [Berg / Lyrische Suite:] the vocal rendering of the Largo desolato is sung by world-renowned soprano Renée Fleming with remarkable breadth of feeling . . . Fleming finds lurking beneath the surface of Berg's music layers of meaning that heighten the voluptuousness of the composer's deceptively bare word settings. Fleming rises gloriously to the piece's climax, her voice almost becoming another sound produced by the quartet's instruments . . . [Wellesz / Sonette:] It is the beauty of the voice that lofts 'Nur drei jedoch in Gottes ganzem All vernahmen es' (Sehr breit) ['But only three in all God's universe have heard'] into the realm of brilliance . . . The Emerson musicians provide Fleming with a gleaming canvas upon which to paint a bold vista in 'Du bist da droben im Palast begehrt' (Moderato: Gemessen) ['Thou hast thy calling to some palace-floor'], and she seizes the opportunity dazzlingly, applying vocal colors with the imagination of a singing Chagall . . . This disc in fact preserves some of the best singing of Fleming's career before studio microphones to date . . . This disc is a return of Renée Fleming at her incomparable best.
. . . [hats off to the Emerson Quartet for an astonishingly accurate and coordinated account] of the "Lyric Suite", even in those sections that move faster than the speed of thought. . .
. . . Fleming adds some emotional warmth following the Emerson's robust traversal of the "Lyric Suite's" erotically charged music. Even more satisfying is their performance of "Sonette der Elisabeth Barrett-Browning" . . . Wellesz's rarely heard, expressive and expressionistic settings of five sonnets in translations by Rainer Maria Rilke, draw plenty of passion and intensity from Fleming and the Emerson . . . This CD will appeal to those interested in little-known but rewarding 20th-century repertoire (the Wellesz) and, of course, to Renée Fleming's justifiably innumerable fans (including me).
. . . the final "Largo desolato" is projected here with tremendous urgency by the Emerson Quartet. Particularly admirable is their brilliance and accuracy in the formidable semiquaver passagework that opens the third movement, and their careful balancing of the musical line in the more intricate textures of the ensuing "Adagio appassionato". The Emersons supplement their outstanding "Lyric Suite" with a sensitive account of the last movement in an arrangement for voice and string quartet . . . Renée Fleming delivers the evocative text in a deliberately subdued manner. In contrast, she opens up a much greater range of colours and emotions in Wellesz's "Sonette der Elisabeth Barrett Browning". [Berg / "Lyrische Suite"]: The Emerson Quartet, always a precise and even cerebral outfit, bring a splendid clarity to the piece, but with a sumptuousness and passion that make it remarkably engaging . . . Fleming is on splendid form, with a mix of intellectual hauteur and moments of ravishing emotion . . . [Barrett-Browning's "Sonnets from the Portuguese"] make an excellent pairing for the Berg, being sumptuously expressive. Fleming's performance in particular is full of emotional depth. The CD's short closer, Zeisl's "Komm, süsser Tod", is also exquisite. The Emerson Quartet's new lease of life with Paul Watkins as their cellist is perfectly demonstrated in their warmly expressive account of Berg's masterpiece . . .
[Berg / "Lyrische Suite"]: The performance of the work as a whole is immaculate: every nuance in the score is observed, and Berg is one of those composers who provides directions for nearly every note. It is also objective: this is how it goes, they say, and they are quite right. This would be an excellent version to learn the work from. When it comes to the vocal version of the finale, Renée Fleming has exactly the kind of luscious voice which Berg imagined and she sings with great feeling . . . [Wellesz / "Sonnette der Elisabeth Barrett-Browning"]: [these songs] are most attractive and make an inspired choice of coupling . . . [Zeisl / "Komm, süsser Tod"]: This is a beautiful short work and I should like to hear more of Zeisl's music . . . The recordings sound well in a medium concert hall acoustic . . .
[Berg / "Lyrische Suite"]: On this recording, the marvelous Emerson String Quartet gives a captivating, vividly colored account of the probing and profound six-movement work . . . Fleming's performance is simultaneously self-effacing and painfully expressive . . . Fleming sings in suitably mezza voce fashion through most of the piece, but her impeccable control and ability to sustain seemingly endless phrases is intact. She turns suffering into something sublime . . . [Fleming unleashes a broader dynamic and expressive range in the Wellesz song cycle] than she does in the Berg. She still serves the music faultlessly, but she takes center stage a little more conspicuously. Consequently, she's an exemplary exponent of the passion Wellesz finds in Browning's poetry. Fleming and the Emersonians deserve a great deal of credit for resurrecting this sweeping, turbulent but highly gratifying cycle, and for giving it such a gripping performance . . . [Zeisl's "Komm, süsser Tod" is elegiac] and sweetly mournful, it makes a perfect cap to this outstanding release, which incidentally reveals the soprano plus string quartet combination as a brilliantly communicative dramatic medium. Renée Fleming sings beautifully . . . The recorded sound is up to Decca's usual high standards.
. . . [le meilleur du disque arrive avec les beaux "Sonnets op. 54" pour soprano et quatuor à cordes,] défendus ici avec soin et un immense métier . . . Une page très inspirée à (re)découvrir . . . [la vaste "Suite lyrique"] bénéficie avec les Emerson d'une discipline impeccable: Ils misent sur la splendeur de la pâte sonore et raffinent . . . les sinueuses ramifications polyphoniques.